Every April since 2012, thousands of designers, engineers, artists, educators and students have participated in the International Space Apps Challenge, organized by NASA. What started off as a napkin drawing in a San Francisco hotel lobby quickly became a 2000 person strong event spread across 25 cities, in 2012. In the years following, it only grew, (the 2013 edition being the largest hackathon in the world), a testament to its organic, grassroots approach. 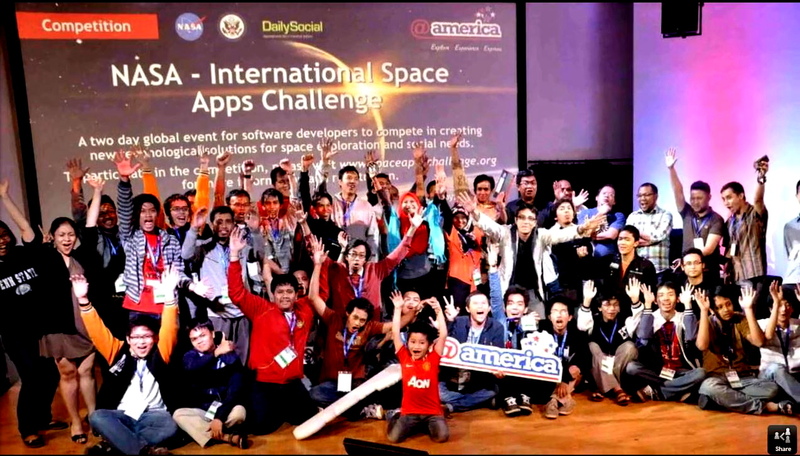 The 2015 space apps challenge reported over 13000 participants from 133 locations. "The International SpaceApps Challenge is an international mass collaboration focused on space exploration over one weekend at locations all over the globe. The event embraces collaborative problem solving with a goal of producing relevant open-source solutions to address global needs applicable to both life on Earth and in space." A particular notion this event has not been able to shake off, even after 4 years in existence: the name is a misnomer – the Space Apps Challenge is as much about life on earth as it is about outer space. It does not also restrict itself to smartphone applications alone; it refers to a much broader definition of this term. Additionally, mass collaboration refers to multiple teams spread across the globe, working on their own unique solutions to the challenge areas proposed by NASA. Last year, there were 35 challenges proposed across four categories: Earth, Outer Space, Humans and Robotics, ranging from mapping of clean drinking water on earth, open source air traffic tracking to visualizing global food needs/capacities and designing drones for space station crew assistance. The format is truly open - solutions to challenges can be of any form, including robotics, games, data visualization, architecture, hardware design or educational content. What does mass collaboration entail here? While hackathons began with a focus on developers and software coders, present day hackathons have evolved to become much more inclusive. Current obsessions with the Internet of Things and Virtual Reality trends for instance, have allowed for hackathons where dancers, neuroscientists, computer engineers, architects and movie-makers come together. The greater the number of ideas generated, the better. The more diverse the perspectives around these ideas, the more we progress towards solving challenges effectively. Most of you reading this already have one thing in common – at some level, you identify as a space enthusiast. Whether you are an aspiring aerospace engineer, a space professional, or anything else, the Space Apps Challenge provides a platform for us - technologists and enthusiasts alike, to come together and engage with publicly available data. And this becomes effective in the long run only if each of us takes ownership of our local communities. Mike Caprio says it best: "The whole point of such collaborative efforts is that anyone can mentor anyone else. Anyone can come and work on these problems, they can share their expertise and share their knowledge." In this spirit, having the right kind of mentorship at the Space Apps Challenge can go a long way. What does that mean? Mentors are people with domain-specific competence, there to guide others and show them different approaches. They ensure that original thought is not discarded as unconventional. These competences can range from robotics, geospatial knowledge, game design to marketing and animation. Participants are mentors to each other. A diverse mix of people is exactly what the Challenge encourages - to crowdsource new ideas, especially from voices outside the mainstream. At an event like this, participants engage and discuss solutions over pizza and beer, sometimes even sleeping at the location. This makes for a very informal surrounding - prime grounds for effective brainstorming sessions. All Challenge events are organized by unpaid local volunteers who take up the responsibility of hosting, funding and overseeing the logistics of operating the event. This is the very reason why, with a bottom-up, decentralized approach, the Challenge has paved the way for innovation. Those of us in the space industry then, can serve not just as participants in such initiatives, but also help nurture our local space communities. A professional with some expertise can offer his/her time to judge, or speak at a nearby Challenge. Students and educators can volunteer to help with organizing the event. We can reach out within our universities and schools to mobilize others around us to participate. Organizations entrenched in the industry and hot new space startups can offer to partner with a nearby event. They can provide mentors and jury members, sponsorship for the event, food and refreshments, and even prizes for the local teams. Even after the Challenge, teams with promising solutions will require guidance and and support to have their project go beyond the hackathon prototype phase. As local collaborators in this year round effort, we can help build better connections between promising projects and competent individuals willing to act as mentors. If there is no Space Apps Challenge in your locality, apply to start one! Even if you have no team, NASA takes the time to put you in touch with others near you with a similar goal. It is in these real world networks that we create actual value. Another assumption that enthusiasts far removed from the academic/professional space community sometimes have is that space science is hard. It is just as hard as any other field of science and engineering, but is just as simple too. In addition to encouraging space enthusiasts to actively participate in the local spheres, we can also educate them on the different ways of engaging with the space industry. Interesting projects can be borne out of long term collaboration across industry defining boundaries. Planet Labs now has an ongoing artist in residence program, providing their Dove satellites as canvas. Joao Martinho Moura, a media artist, created the incredible Where is Rosetta and View Rosetta's Comet visualizations with ESA. The more we spread awareness, the more people are interested to partake in the space community. As Ali Llewellyn at NASA wrote last year: We cannot ever approach individually what we can only accomplish together. The 2016 Space Apps Challenge is going to surpass all previous editions. As of now, over 180 cities are set to host the Challenge. The Challenges are split into six categories this year: Aeronautics, Space Station, Solar System, Technology, Earth, Journey to Mars. If you are reading this, you have an interest in space. Head over to spaceappschallenge.org and keep yourself updated. Once more, one weekend in April is going to make a lot of noise for the global space community. We are pleased to announce that from now on organisations have the possibility to have one or several official coordinators for their Board on the platform. Coordinators will be able to post updates on behalf of the organisation and directly interact with the community. They will also be able to edit the Organisation information.